It’s been a hard few days for me. A lot goes on in life. Client needs, family needs and of course business needs, so the news that Robin Williams had taken his own life hit me hard. I am not one to follow celebrity. I rarely watch the news. I am too involved in the present. Too involved with Shifting the Paradigm of Sport Psychology & Mental Training to something that everyone will see as important and use to watch what goes on outside my little window of life. I work with people who are normal to exceptional. I understand genius on the field and off, it has been my life work. How to bring people to the next level. So I look for it in others, not just in sports, not just in business, but where it exists. So I have watched the genius who was Robin Williams intently. RIP Robin Williams. I’m old enough to have watched Mork from Ork. To have seen him play-off with Jonathan Winters. To have seen him in roles like Popeye and wondered how things would go from there. Good Morning Vietnam was eye opening. Yes there was comedy, the riffs as he was playing the DJ role, but there was much more there, wasn’t there? He could act. 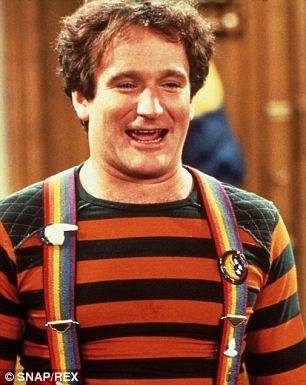 He was no longer Mork. Not the stand-up comic, but an actor. Eye opening. RIP Robin Williams. Then came roles like Dead Poets Society and Good Will Hunting and the depth of his abilities grew more. He moved me in ways I couldn’t understand at the time. From comic to Soldier DJ to Teacher and to Psychologist (naturally this one hits home) he was remarkable. His family movies came out when I was raising my sons. Their first thoughts of him were from Aladdin and Jumanji. He touched all of the buttons. He played some disturbing roles as well like pervert killers. He played every man and he played villains and comics. There are great actors and he was one. RIP Robin Williams. There was the other side of him as well. Well documented by the media. He talked about it himself. Battles with drugs, with alcohol, depression. When I have looked at genius and tried to understand it, I am always in awe. It can be the genius of a Tiger Woods, Steve Jobs, Ernest Hemingway or Albert Einstein, it doesn’t matter what their field happens to be. The apparent effortlessness of mind and body. It is what I try to teach after all to those I work with. 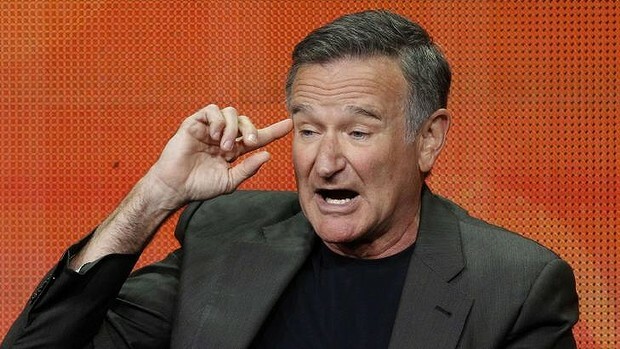 Not with all geniuses of course, but a disturbing number have suffered from mental illness ( Don’t start, I am not implying anything with woods or the others) as did Williams. RIP Robin Williams. Here is one thing I know and mental illness is not something I work with, but have a bit of insight with. It has to be worse when you are a genius. When you are aware of every thought, every feeling. When you measure yourself not against other normal people but against the greats. Can you see how hard it is when you are depressed and you know you are in control, that you are the smartest person in the room and you can’t pull yourself out. The highs and lows of Robin Williams life are of what dreams may come. It is hard to go quietly into the night. It is difficult to watch yourself be chased by demons and not be able to remove yourself from the path. I wish to all that is holy that Robin Williams had found another way. RIP Robin Williams. He was for me not just another actor or comedian. He was genius. He was what I want others to find within themselves. What I want to find within myself. To know you are at another level. This is where greatness comes from. It is a terrible thing to be so smart, to be so aware that you see all and to see the importance of life slipping away from you. I wish to hell he’d have found another way for all of us. To have found a funny way to say good bye instead of what I know he believed as the only way out of the pain. Robin Williams died this week. I will not criticize his way out. I will honor him by remembering his roles and what he gave me in laughter and experience. RIP Robin Williams. Those who condemn his actions as a selfish act need to walk in his shoes. It would be different I think for me if he was the 20 something Mork who had taken his own life. Then it was the waste of what might have been. He was a few years older than me. He had fought these feelings most of his life. The things that made it better (Drugs and Alcohol) really made life worse. Were there other ways out. Of course there were. There are always options. But sometimes people get tired of the good fight. I am sorry he is gone. I will miss what might still have been. Go not silently into the good night, my friend. RIP Robin Williams. Nanu Nanu! 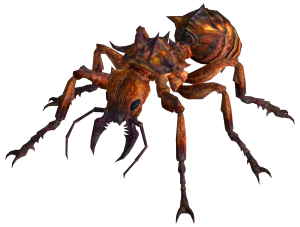 So the ANTs will inherit the Earth (if you let them). OK so for a change I’m failing to be witty in my title. No wait, I’m never witty. I’m never humorous. 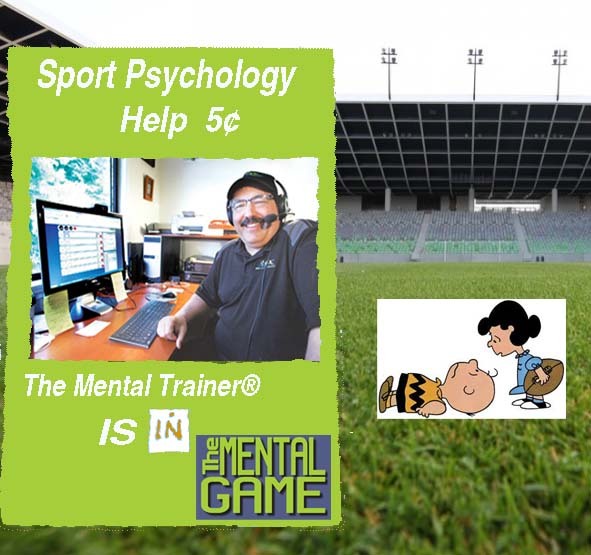 I am the least funny sport psychology consultant aka Certified Mental Trainer® on Earth. Why would I ever attempt humor to get a point across? Even my kids think I lack a complete sense of humor. I might just be the most serious unfunny person on the planet, maybe the Universe. Perhaps this would be a good place to take a breath. A few deep breaths as a matter of fact from below the diaphragm before I am so self-conscious I throw this post in the recycle bin and click the Empty Recycle Bin button. If I do that, I give up an opportunity perhaps to reach someone who overwhelmed by ANT’s, will miss out on tremendous opportunities. OK I’ll take a chance and keep the title, after all some people do laugh at some of my stories when I am speaking. I’ve had more clients laugh than cry in my office (though there is a certain sport that is more tearful I have found). Even on occasion one or more of my sons have had milk come out their nose because of something I said was funny. Maybe this means I may not claim Mr. Unfunny Person in the Universe Award. 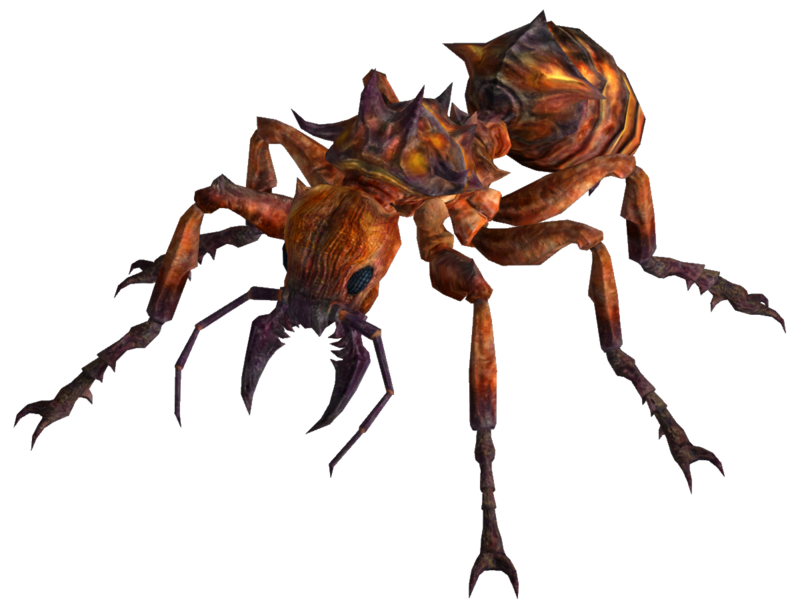 This is an example (totally made up of course) of a CBT- cognitive behavioral technique designed to help someone deal with an ANT. An ANT is an Automatic Negative Thought. We have them all of the time. The most ridiculous things pop into our heads and most of the time we accept them as truths, because there is no one to dispute them. They come from somewhere in our unconscious perhaps. Triggered by some association or another and we buy in. We believe in the thought. After all it’s our own thought. How can it be wrong? Even if it makes us sad, mad, nervous or leaving us with a feeling that things are out of control. Hell, most of the time we don’t even recognize we really had that thought (this is the subject of a different post, but a real good reason to Journal). According to some of the research I’ve read we have more than 60,000 thoughts per day. We really can’t pay all that much attention to every one now can we? Yet we react to them just the same. We form a map if you will of what we can and cannot do. If you are an athlete why would you want an ANT telling you what you can or cannot carry out. Back in my youth I would never learned to dunk a basketball if I bought into ANTs, as back then I didn’t know a lot of six-foot seventeen year old’s from my neighborhood that could. We tell ourselves all sorts of things that we need to fix. Write down your ANT (Automatic Negative Thought). This is harder than you think because first you need to recognize your feelings. So, if you are sad, mad, nervous or feel like things are out of control, stop a moment and identify what you are thinking. I’d like you to write or type out what you are thinking and feeling. This in itself is very effective as you are clarifying your thoughts and emotions. A good deal of the time you are projecting outcomes based on these thoughts. Some call this Fortune Telling. If I do this, then this will happen to me in the near future. If I write a funny tittle to my post and no one finds it funny, they will not call me for an appointment. If I play the golf course aggressively I will bogey the par 5 and loose the tournament. Or then there is Mind Reading. If I tell a funny story someone in the audience will think I’m stupid for trying to be funny and again not hire me. In this case I am projecting what someone might be thinking. A golf example of this is where one of my golfers three putted on a green from 12 feet because two college coaches were watching. 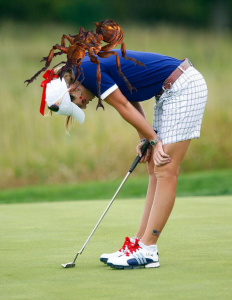 She thought, if I miss this putt they will think I am terrible and not be interested in me. That was just last week. Yesterday she shot a 70 in her first round, 2 under par. This was her first sub-par round ever. Even with coaches watching. Get rid of ANTs and positive things may happen. One of the things that happens to us when we are either fortune-telling or mind reading is that we are not in the NOW. We are in the future and we cannot play effectively out of the present. The other thing is that our game or what we want to do is affected by those negative thoughts and emotions to the point where some people just give up. The next step is to dispute those thoughts. Think of yourself as a teenager (many of you might still be). If you are like me on rare occasions (OK not so rare) I talked back to them when they said something I didn’t like. My boys of course never talk back to me. (Another attempt at humor) Use that same tone of voice, if you will and dispute what the ANT is telling you. Break it down and show yourself the lie, the un-truths. You have a 12 foot putt for birdie. The coaches just saw me hit a great shot. I can roll this putt in. When we conquer the ANTs, we allow ourselves to not only be present, but we can perform at much higher levels in sport and everything else with positive focus. This plays a major role in our confidence levels, focus and how we deal with stress. I guess I will keep the tittle as is. Because I know I have produced magic from time to time and milk has mysteriously shot out of all of my sons’ noses one time or another. So perhaps while I may not be Robin Williams, Eddie Murphy or even Lenny Bruce I can produce a smile once in a while. If that is the case, then my original statement to myself cannot be true and if it is not all true and can’t be real. I guess I can keep the tittle, go for a small smile or laugh. I might even get that ANT off my own back and go out and play a good round of golf. Hold on. Let’s not get delusional here. If you would like to join me on the golf course or in my office please drop in at The Mental Game. I am helping with a group here in the area called The Tru Athlete. A very cool idea. Competitors compete as a team in three sports. Soccer, Flag Football and Volleyball. It is Co-Ed. Ten players per team. Two female players on the field / court at all times. Champion is crowned by team that accumulates most points in all events. All in one day. I am doing pre-competition talk to get everyone ready. Not really a motivational talk, because as you know I don’t do that. I help others find their motivation. But none the less I will try to inspire a few teams and be there during the day to help with their frustrations, anxiety and focus. I am setting up in a booth. It will look something like this. I hope you know who doesn’t mind. I’d hate to have her pull the football away from me for taking her job. Yes I am charging a nickel that’s 5 Cents. Depending on the long lines (right) consultations will be five minutes or longer. Might give them some exercises to do or play some games. I could do a concentration / focus exercise for a time and give away a prize. That could be fun. Fastest time wins a book or 1 hr consultation. Say a $1 per entry. Who says Mental training can’t be fun? All money from consultations will be given to charity (not sure which one yet). I will also sell books and give some of the profits to the same charity. It should be a fun event. Not the usual event I work at. There isn’t always beer when I’m working. But it will be fun. Come join us at Starfire Sports July 27th, 2013. It will be a blast. It’s The Tru Athlete. They will be doing more of these events around the country. Might have to send my booth with them if Lucy doesn’t mind, that is. I want to run you through a demonstration I have used in workshops and with individual clients. It’s called Stress and a Glass of Water. I didn’t invent the analogy, but have used something like this to help people understand the concept of stress for a long time. If I were to ask you How heavy is this glass of water? What would your answer be? 8 oz? Maybe 12 oz? Absolute weight doesn’t matter really. It depends on how long you hold it. If you hold it for a minute, it’s not a problem. If you hold it for an hour, you’ll have an ache in your arm. If you hold it for a day, your arm will feel numb, it may feel paralyzed or it fall off (or so I’m told). In each case, the weight of the water doesn’t change, but the longer it’s held, the heavier it feels. Stress and anxiety are like the glass of water. Think about them for a short time and everything is fine. Think about them for a longer period of time and they begin to feel uncomfortable. And if you think about them all the time, you will feel paralyzed – incapable of doing anything or moving forward. I can add to this analogy for you as well. What happens when we add more water? What if you fill the glass to the top? Things tend to get shaky. You have difficulty focusing and water spills out. Now you worry about the water that has spilled too. If someone is talking to you now you have difficulty paying attention and holding the glass still. You’ve also been taught that spilling is bad and you should be ashamed of your self for letting those emotions, er I forgot water spill. So now you can’t focus, you feel shame and to top it off your arm hurts. You might just consider to put the damn glass down for a while. 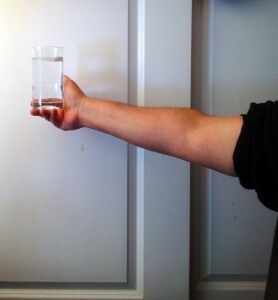 While it is down and feeling returns to your arm, you can clearly use your skills to deal with the task which caused you to hold the glass of water for so long. Most people choose to continue to hold the glass of water rather than put it down. Sometimes it can even be of help to release (spill) a bit of water. There is no shame in spilling a bit of H2O, after all it’s just water. Athletes and business people who have heard that being mentally tough means battling stress by holding their arms up to keep the glass of water from spilling have missed the point. Toughness isn’t enduring pain for little reason, mental toughness is about understanding that emotionally intelligent people sometimes put the glass down and figure out a better strategy. This is in part what mental training is all about. Learning the skills of when to hold it up and when to just put the damn thing down. I am always looking for great analogies / metaphors. What’s your favorite? Share with me and I’ll give you credit. Sharing is a valuable teaching tool to reach more people. Learn from a Jackass is an old motivational, (scratch that) inspirational story. It has been repeated many times. I use it occasionally to make a few points about Mental Training. I’ve no idea where I first heard it; though I know it was years ago. I realized today that it is one of those stories I’ve not used here. So indulge me and learn a lesson from a Jackass. 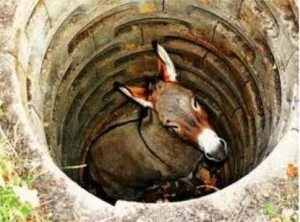 One day a farmer’s donkey (officially recognized as a Jackass by Webster’s) fell down into a well. The animal brayed (Heehawed) for hours as the farmer tried to figure out what to do. Finally, he decided the animal was old, and the well needed to be covered up anyway; it just wasn’t worth it to rescue the jackass. He invited all his neighbors to come over and help him. They all grabbed a shovel and began to shovel dirt into the well. At first, the donkey realized what was happening and cried horribly. 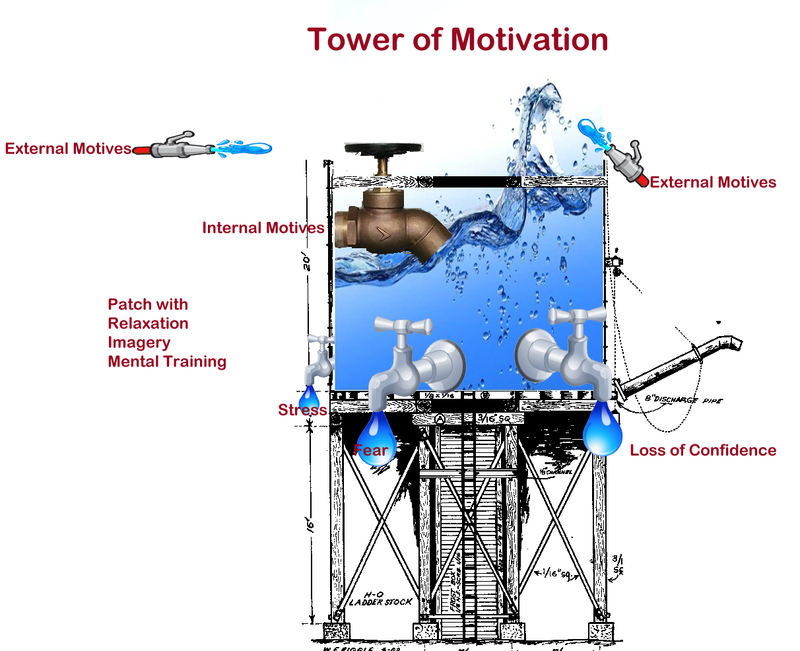 If we look at a metaphorical generalized model of what motivation might look like it might be a large water tank. I am not in any way removing my supposition that we need to think about motivation as a triangle. This is just another way of generalizing about motivation to help athletes understand more about the simplicity of motivation overall and some of the complexities. So if we use a picture of a large water tank I think it will help with the explanation. There is no top to the tank and so for many of us motivation, drive, enthusiasm, or the Fury just over flow the tank. The tank is filled mostly and best by a hose that is inside the tank. Sometimes it is filled by other people. Oddly they make us offerings of speeches, carrots and sometimes they use fear which can be a motivator as well. All of these hoses are smaller and are far less effective at filling the tank. Sometimes our tank develops hoses in it. Normally when we are fully focused out internal hose keeps up with the out flow. Sometimes it is difficult to keep our internal hose on all the time and the leaks sap us of some of our essence. Holes develop for lots of reasons like a lack of confidence, stress, poor team cohesion, outside distractions, etc. If the hoses cannot keep up with the leak, we see less of the motivation we usually have and performance generally diminishes. We can patch holes of course. Generally what happens when things are leaking is that we lose ourselves and take our hand off our internal hose regulator. If we can’t keep up for the inside it is very difficult for all of the outside hoses to keep up. It becomes a situation as in Hans Christian Anderson’s story of the little Dutch boy with his finger in the dike. Eventually you can’t keep up with the leaks and having stopped filling from the inside you end up being no longer motivated, even though it is something you wanted very much to do. Eventually many people at that point just stop trying to keep the valve open and have to shift. Shifting is one way of closing those holes. The problem is after the shift things are never really the same until the person finds something that re-ignites their passion. External Motivation = Smaller hoses controlled by other people. It takes a lot of these hoses to top of the tank. Leaks = Stress, anxiety, loss of confidence, fear and many others. You can keep the leaks small or patched by using mental skills like relaxation, imagery and other cognitive behavioral techniques. I think a huge secret in all of this is understanding your Big Why. If you understand your own triangle you will have a far easier time keeping your hand on the valve or perhaps even think of it as pedal to the metal which ever works best for you. Finding and knowing your why will always help you keep the water near the top. It will allow you to rely far less on all those small hoses. It gives you ultimate control because the big hose you control so when you need to back off, even when your coach is overly enthusiastic, it is in your hands. Same goes for when you develop leaks. Adding a little extra water in will allow you to use your mental game skill sets to seal up the holes, ultimately with a patch that neither requires attention or the little Dutch boy’s finger.